Are we alone? Where is everybody? We came up with DrakeEQ to provide a visual answer to the extraterrestrial question(s) using the stunningly elegant Drake Equation. We've coupled the calculator to a mesmerizing Milky Way in motion. Perform beautiful thought experiments with this one-of-a-kind visual tool. DrakeEQ is both educational and entertaining. At 7 years running, DrakeEQ is also one of the longest continuously supported apps on the entire App Store! 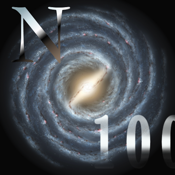 Use this fun simulator for the iPhone to graphically quantify the number of advanced extraterrestrial civilizations in our Milky Way Galaxy. Are we alone? : DrakeEQ computes/displays civilization count and draws them to the display. Where is everybody? : DrakeEQ approaches the Fermi Paradox by positioning the civilizations in 3D space and computing the average distances between them. Learn about the famous Drake Equation through direct manipulation of its 7 parameters with DrakeEQ. Easily tweak equation variables using fun drop-down manipulators. See our DrakeEQ HD version optimized for the iPad! Drake equation. Wikipedia, The Free Encyclopedia.